Over the next two weeks, in an attempt to put migrant voices at the center of our advocacy and communications, we are going to share with you some stories of those brave children, women and men we have worked with over the years. Their bravery and resilience are an inspiration to the MOAS team. It is tempting, when talking about a group of people, to begin to generalize and homogenize stories into one representative stereotype, but as different as individual people are, so are their stories, motivations, dreams and journeys divergent and unique. Below are two stories which highlight and celebrate the diversity of our community. I came here to this place, Unchiprang, in September 2017 with my granddaughter’s family. I used to live with them in Myanmar and we made the decision to take the journey to Bangladesh together when violence broke out. The crossing itself was very hard for me and there were times on the journey when I was sure I would not make it. My granddaughter is the only family I have now, I don’t know where anyone else is, or if they have survived. I am living in the camp just like all the other Rohingya here, and things are not easy. I am barely able to move by myself and the camps are difficult to get around, so I spend most of my time in our shelter. This is not the only time I have seen violence in Myanmar, it has been part of our reality for many years. I am grateful to be with my granddaughter’s family and happy that they are safe now but I am very unsure of our future and do not know think I will ever see Myanmar again. From one of the oldest, to one of the youngest, Nuur Fatima is one of many babies we see passing through the Aid Stations. These very young children make the journey at a tender and sensitive age or are born in Bangladesh and grow up in the camps, attending school and navigating childhood in a crisis environment. Here’s what we know about Nuur’s story so far. Nuur was brought in by her young mother, just 20 years old, in January of 2018. They had arrived in the camps in the surge of September 2017, when Nuur was very young and the conditions in camp had adversely affected her health. 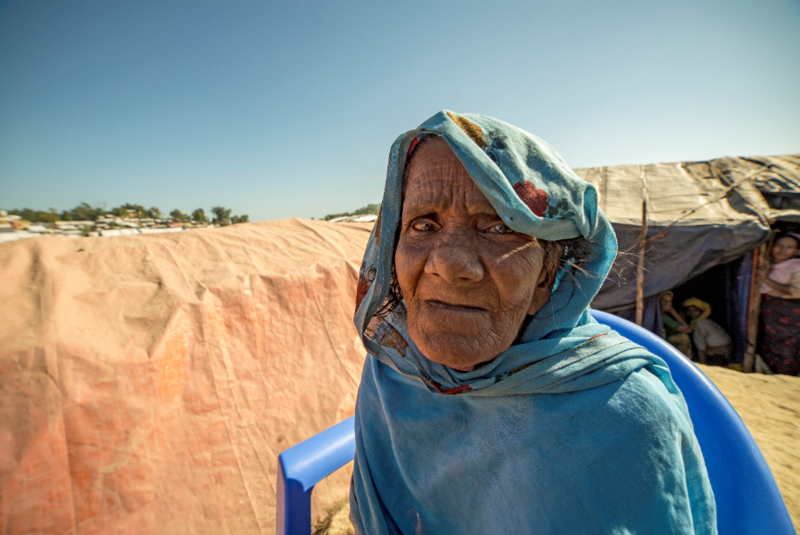 Nuur’s mother must travel through the camps during the day to collect water, fire-wood and access the services she needs. During these times she either takes Nuur with her, carrying her as she does her errands, or leaves her with neighbors in the camps in return for small favors. The shelters being musty and badly ventilated, the designated space for cooking, resting and all other family activities, Nuur fell prey to a common affliction for the youngest in the camps- respiratory distress. 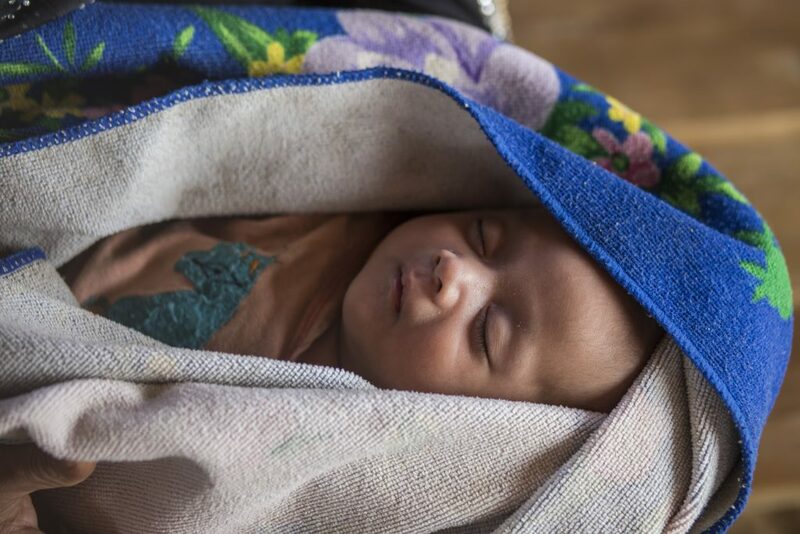 When Salem brought Nuur to the MOAS health clinic she was feverish and struggling to breath. She will recover with treatment and care, but the camp environment will never be an ideal space for development and growth. This week we look at two very different stories of Rohingya refugees we’ve met in camp. Join us next week to read about two people rescued by MOAS in the Mediterranean as we continue to highlight individuals’ stories and put migrant voices at the heart of our work.